Christopher Eyles Guy Bowen is an Australian politician who is the current Shadow Treasurer of Australia. Bowen is a senior Labor Right figure. He was briefly the Interim Leader of the Labor Party and Leader of the Opposition in 2013 after Labor lost the federal election. Before this he served in a number of positions in the Rudd and Gillard Governments, including as Minister for Financial Services, Minister for Immigration and Citizenship, and Treasurer. He was first elected to the House of Representatives in 2004 for Prospect, however the seat was abolished and he has represented McMahon since 2010. 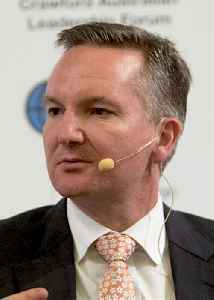 Shadow Treasurer Chris Bowen will take aim at the coalition's tax cuts pencilled in for 2022 and 2024 in a speech, saying they are "reckless" and unfair.